« Vamos a la cena Navideña! Christmas dinner in the tradition of Spain and Latin America! 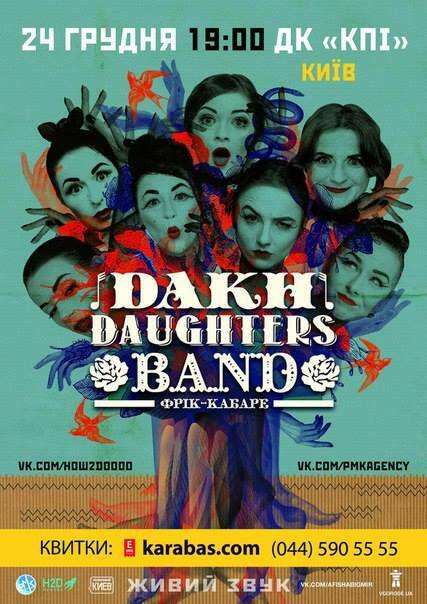 Dakh Daughters represent a new generation of Ukrainian musicians who are not afraid to express themselves. Frick cabaret every year is gaining popularity, working on the verge of provocation, reality and illusion. Seven graceful girls – discordant sirens, fifteen instruments. The rapid overcoming boundaries between styles and combining them in unexpected sound collages. Cekret unifying power of all these varied and creative personalities in a band – a theater, because all the girls of this project primarily actress. Every musical composition “Dakh Daughters” – mini-performance.